The following short story inspired by The Emperor’s New Clothes, is one of the short stories from my collection: Supernatural Fairy Tales. The Kindle eBook will be Free August 5, 2014. 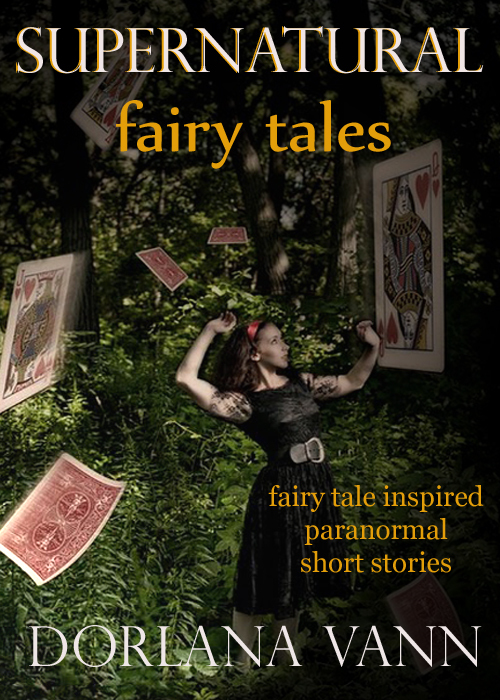 Fairy tale inspired paranormal short stories. fairy tale + paranormal element = supernatural fairy tale. These 9 Supernatural Fairy Tales are not retellings of the original fairy tales but were inspired by them. They are paranormal themed stories about vampires, ghosts, mermaids, witches, and more, in genres ranging from romance to thriller. And fair warning: they don’t always have a happy ending. His apartment was on the top floor of a tall apartment building. Everyone knew he was a vampire, so no one would have bothered him even if he had been on the very bottom. That was why he found it strange when he heard the knock. After opening the door, he asked, “May I help you?” but thought: magnificent—take-out delivered to my door. “There is a reason for this,” the vampire said. The second young man said, “I’m Mark, and this is my partner, Trey.” He held out his hand graciously and, without a mere tremble, he shook the resident’s hand. Intrigued, Smith sought to connect with the gentleman’s eyes. When he avoided this with skill, the vampire couldn’t help but grin, something he hadn’t done for centuries. “Perhaps you have happened upon the wrong doorstep,” he said, only because he liked them. “Hmm,” Mr. Smith said. “Is that right? Well, in that case, do come in.” It had been a long time since the vampire had guests—that were alive at any rate—and he found that he was quite enjoying the change of pace. Suddenly the mundane lifestyle that he had become accustomed to became clear: sleep, eat, and watch TV. He had been doing the latter before the interruption and used the remote to click off the early evening news. “Please, have a seat,” he told the boys. “I’m afraid I do not have any refreshments… that you would enjoy.” He couldn’t ignore the sudden sound of Trey’s heart as it pumped a refreshment of its own. He licked his lips, knowing the evening could only get better. “Of course,” Mark said, pulling Trey down beside him as he sat on the couch. “Our company, of which Trey here is a new recruit, provides a unique service to, shall I say, our nocturnal clients. We understand and sympathize with the fact that you are a prisoner in your home from sun-up to sundown. We have developed a fabric that is solar and flame resistant but extremely lightweight. We design and produce clothing made of these exclusive materials.” Mark reached inside his bag and pulled out a black swatch. Handing it to the vampire he said, “This is the most popular with our clients, but we do offer many different colors. All we need to get started are your measurements. As you can imagine, this discreet service is not cheap. It’s company policy to receive half…” he stopped when it seemed he had lost his audience. The vampire had walked into his modest kitchen and turned on the stove. After all, he wasn’t born yesterday. He put the little piece of fabric over the flame. Nothing happened. He was impressed, already imagining the possibilities. The thought of walking outside during the day after so many, many years was very enticing. The young men took out their tailor tools, a small catalog, and more fabric samples. In no time, Mr. Smith had chosen a dark gray, pinstriped suit with a high collar, black gloves, and a hat complete with ear and neck coverings. As the weeks passed, the vampire actually became fidgety. He thought about all of the wonderful things he would be able to do during the day. He could even do lunch—if he were to be so bold. He began to amuse himself as he pondered curious things that didn’t have to do with feeding. He wouldn’t have to hide in shadows. Maybe he would see a matinée. He could walk among the mortals, saying, “Good afternoon.” He picked up the catalog the young men had left behind. He thought that next time, he might even buy khaki. He would almost be… human. Finally, the knock came at the door. Mark held up a black garment bag. “I have your new suit,” he said with a smile. “Trey told me he had a previous engagement,” he said and then winked. “Between us, I think he’s a little afraid that you no longer need us.” After giving the vampire ample time to answer, Mark said, “You know, I am your personal tailor, and the only way to get more of these, is through me.” He put the bag on the couch and unzipped it. He pulled out a handsome, well-tailored suit. It was just like the one in the catalog. Mr. Smith couldn’t hold back his excitement and snatched it out of Mark’s hands. Mark winced from the sudden pain the vampire’s nails had caused. The amicable mood immediately transformed into intense as they both looked at his hand, the red blood slowly escaping its safe haven. For the first time, the vampire caught and held Mark’s stare. It was so unexpected and so challenging that it seduced the vampire into wanting to win. It had been a long time since he had fought such a tough challenger. But of course, the mortal was no match in the end. The vampire dropped the suit, catching Mark before he hit the carpet and carefully placed him on the couch. He grinned, his fangs hungering for the taste of such a satisfying victory. Nevertheless, he looked down at his new clothes. The young man would be out for a while, plenty of time for him to try out his new suit. Although the vampire had acquired quite a wardrobe over the centuries, he had never felt the likes of the material that was against his body. It was soft, like silk, yet form-fitting. He wished he could see himself in a mirror. He settled with knowing he would be able to analyze the expressions on people’s faces. Even though the glare of terror so pleased him, he was anxious to see a new look in their eyes; one of awe and admiration. Complete with gloves and hat, he walked out his door. It took Mark a moment to stop his dream and to realize he was asleep. He opened his eyes, took in a panicked breath, and sat straight up. When he clearly remembered his predicament, he hastily felt his neck. The Vampire’s New Suit is one of the short stories from my collection: Supernatural Fairy Tales. The Kindle eBook will be Free August 5, 2014.